It’s not news that the art industry has a problem with its white-maleness — museums are grappling with these issues and mounting some of their best and most diverse shows in recent years (for example, the Met’s Kerry James Marshall exhibition in 2016). Trouble is, auction houses are also following this call for diversity and frequently, conspicuously include a swath of paintings by black artists amidst their typically white-male offerings. A Sotheby’s evening sale in May 2018 comes to mind, which presented a veritable who’s-who in non-white art today: back-to-back, the sale opened with works by Mark Bradford, Julie Mehretu, Lynette Yiadom-Boakye, Glenn Ligon, Njideka Akunyili Crosby, Kerry James Marshall, and few lots later, a painting by Barkley L. Hendricks. Each of these works eclipsed their estimates — doubling, tripling, and in the case of the Yiadom-Boakye and Crosby paintings, selling for about 500% more than the Sotheby’s prediction. What’s happening here? While it’s not fair to make assumptions about these bidders, it does appear that private collections, like museums and auction houses, are seeing the importance of diversity in their holdings and are willing to spend a lot for an opportunity to tackle this issue as an investor. But, what do these transactions do to black artists, whose paintings are often being transformed into not just an investment commodity but an emotional and social one on top of that? Can white philanthropy engage with black art in a way that doesn’t reduce the work to a bargaining chip, into proof that a person is socially mindful with their money, woke? This is a problem, obviously. So what, in the unfortunately misguided words of many, can the white and affluent do to help? It’s a conversation to have, not an obstacle to overcome. 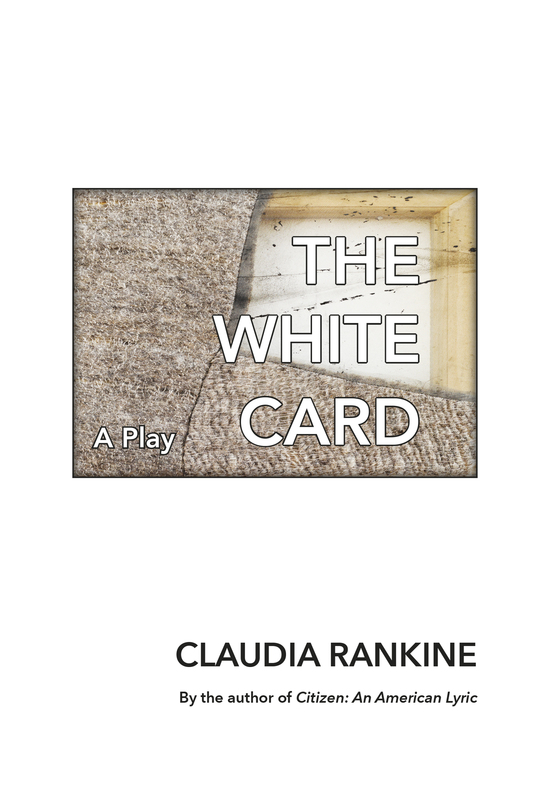 And Claudia Rankine’s astonishingly good play The White Card does exactly that: it converses. Rankine explores these themes with surgical precision and the clarity of a person who has been listening for years to all sides of this uncomfortable but important discussion. While Rankine could surely pen a blisteringly good essay on race, art and well-intended white folks who are trying to do good in the world, there is a sparkling genius to presenting these ideas as a staged production with players. A play allows for different perspectives and for these perspectives to clash, and shows how a shared goal can grow from disparately-rooted intentions. Rankine’s play also shows that the productivity of any discussion is limited to the people in the room, an idea that is often overlooked by those hoping to change the world. Charlotte Cummings is a mixed media artist on the verge of international fame. Her newest body of work, influenced in part by Teju Cole and Jeff Wall, brilliantly aims to “make visible things that white people might not have to negotiate in the day-to-day.” To achieve this, she intricately re-stages complex scenes in order to capture on film moments of “small inadvertent aggressions” that happen almost too quickly for most to recognize. When The White Card opens, its 2017 and a trio of art-world affluents await Charlotte’s arrival to dinner. The last year has showed us all that there is entrenched racism and xenophobia that no laws seem to alter…. Virginia and I have spent a lifetime believing our intentions are good. We have worked to be good people. The problem is our country lacks moral imagination. This is where you come in. Artists, like you, work from a different positioning. You can imagine beyond what is…. We need art to catapult us out of here. I’m investing in individuals who depict what is really happening out there in the daylight. The Spencers’ dealer, Eric, is there, acting as an interpreter straddling the worlds of the artist and the metropolitan elite. Alex, the Spencers’ outspoken son, arrives later, freshly returned from yet another Trump protest. All mean well, and all strive for a shared goal, but the conversation derails remarkably fast into a passionate but shallow gloss through Black Lives Matter, Michael Brown, and SURJ, to name a few of the many racial discussion points that swirl through the play and today’s discourse. It also becomes clear as the play goes on and Charlotte finds fewer and fewer opportunities to speak, that she’s been transformed unfairly into a synecdochal representation of her entire race. She’s just one person, one observer, but she’s asked to think and speak for all. The play builds at a fevered clip as lines slip out that can’t be un-said, and culminates to an unforgettable peak as the Spencers reveal their latest acquisition. 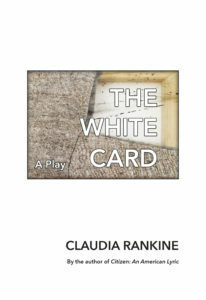 The White Card is a timely and resonant work that should be read by everyone; it is wildly important to discuss its themes, and devastating to see how easily that discussion can fall apart when engaged the wrong way. The play’s art-world elan is dizzyingly on point, and any reader even remotely close to that echelon of society will find plenty reflective glimpses in it’s multi-faceted sheen. It is the kind of work that aches to be read again, to be given to a friend and discussed for days. Although it takes only an hour to read and unfolds entirely in a single quick act, The White Card should linger for a generation or more.